There is a type of arthritis called gout, and it is followed by a lot of pain in the joints, and the pain is even more intense if the joints are near your big toe. Usually the pain occurs throughout the night and it is followed by redness, heat and swelling in the area. Gout may also be developed due to excess alcohol intake, sodas, crash diet, injury, infection, dehydration, etc. which can easily lead to accumulation of uric acid in your blood or hyperuricemia. Naturally the uric acid in our blood is produced from the purine metabolism, which is then transported in our kidneys, where the it is taken out through the urine. 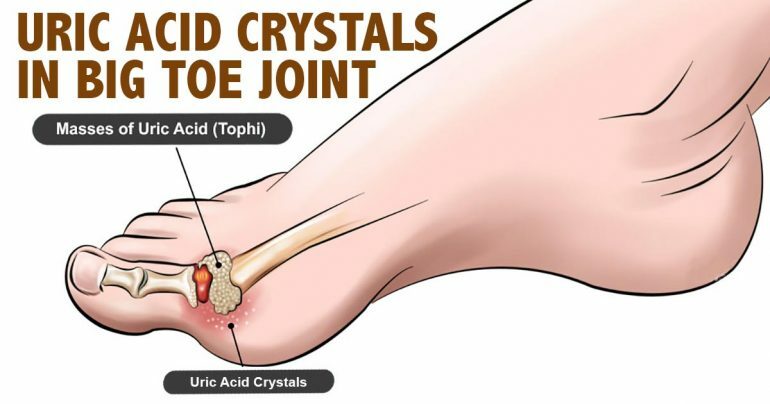 The kidneys may not be able to process them if the uric acid levels are increased, therefore they are accumulated in crystal form around our joints, which is causing the gout. But there is no need to panic, because there are many ways to get rid of gout, naturally. Most commonly chronic gout is treated with medications, but a healthy lifestyle and well balanced diet will relieve from the gout attacks as well. This means that you need to make a few changes in your lifestyle and your daily diet in order to soothe or reduce the gout symptoms. Try focusing on vegetables, seafood, lean meat, unprocessed, unenriched, whole grains, and fresh colorful fruits. To treat gout, optimizing the vitamin C levels in your body can be very helpful. Try meditation, yoga, or listening to music to reduce the stress as much as possible, or simply take a walk in the nature. You should definitely limit the fish, poultry and meat intake, it is best to consume from 4-6 ounces. Drink a lot of natural juices, sugar-free herbal teas, and of course plenty of water. Avoid those products that have a lot of fructose corn syrup. Avoid the consumption of sugar-sweetened beverages. Reduce the intake of products such as, candy, cakes and white bread. Reduce the intake of foods that contain big amounts of saturated fats, such as red meats, high-fat dairy products and fatty poultry. Before dinner and lunch every day, drink one glass of water mixed with one tablespoon of apple cider vinegar, that way you will alkalize your body, that way you will get rid of the uric acid in your body very easy, and the malic acid will be of great help. The sodium bicarbonate is able to lower levels of uric acid in your body, therefore you can start drinking a glass of water mixed with half a teaspoon of baking soda inside, because the baking soda contains a lot of sodium bicarbonate. Each morning when you get up, drink a glass of lemon water on an empty stomach, this will help you alkalize your body, therefore preventing from the creation of the uric acid crystals. Cherries, berries and grapes – These are fruits that contain huge amounts of proanthocyanidins and anthocyanidins, which have very powerful anti-inflammatory properties. Turmeric – The active agent of the turmeric, the curcumin has very strong anti-inflammatory properties, which means it is supportive for our kidney’s functions. Flaxseed – These seeds have the ability to reduce the uric acid’s serum, this was concluded in a study done by the Federal Fluminense University. Parsley – 2/15 of the flavonoids are contained in the parsley, therefore it is able to reduce the levels of uric acid in our body, these flavonoids are the kaempferol and quercetin. Pineapple – It offers powerful anti-inflammatory and analgesic properties due to its richness in bromelain. Devil’s Claw’s Extract – It is beneficial due to its strong anti-inflammatory properties, which were proven by the University Hospital in Zurich. To reduce and soothe the inflammation and pain in your big toe, you should only soak it few times on weekly basis in Epsom salt. To reduce the swelling and the joint pain simply add hot and cold compress on the affected area, where the gout is, only 15 minutes every 2-3 hours. This remedy should be prepared as a juice. Therefore, you can add all ingredients in your blender, blend until the mixture is homogeneous. This juice should be consumed on daily basis. Follow the tips we gave you, hopefully you will see the improvements and effectively fight against the gout as well!